The son of the organized-crime boss John Gotti Sr., John Gotti Jr. wants the world to believe that his days of racketeering are behind him and that he’s completely left his family’s infamous business. It’s a warm and clear autumn Sunday in a typical Long Island suburb. Patched into the middle of town is a small park where parents in windbreakers stand along the sidelines of their children’s elementary school football game. Some cheer intermittently. Some simply talk among themselves, vaguely aware of the game in front of them. On the other side of the field is John Gotti Jr. 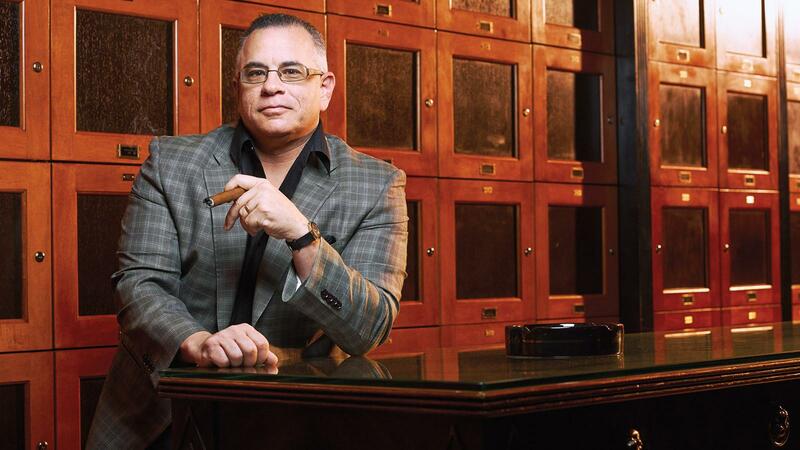 Yes, that John Gotti Jr. The same Junior whose father, John Gotti Sr., became a household name as the head of the Gambino family, and the face of the American mafia after the assassination of New York crime boss Paul Castellano. The same Junior who the FBI believes ran the Gambino crime family in the ’90s while his father was in prison. And the same Junior who nobody seems to believe when he tells them that he’s completely out of the family business. He looks genuinely concerned for a moment and then chuckles again at how preposterous it sounds. John Gotti Jr. who survived prison, multiple FBI investigations, four trials, financial ruin and even a 2013 stabbing fears the wrath of a few irate soccer moms? Gotti never retrieved his computers, but he did recover his humidor seven months later. “The agents took some of my cigars, and the rest of them dried out,” he says. A coach’s whistle blows and Gotti claps. If FBI agents are hiding in the trees that day spying on Gotti (and it’s quite possible that they are), what they are observing is an enthusiastic parent who, like the many cookie-cutter SUVs parked in the lot behind him, is almost indistinguishable from the rest of the crowd. No entourage of trench-coated bodyguards surrounds him, nor is he decked out in a tailored Zegna suit with gleaming Gucci loafers. While sartorial bravado may have been the purview of his father, Gotti’s outfit of choice is simple—baseball cap, jeans, sneakers. He watches his eight-year-old son run across the field and even cheers on a few other kids whom he knows by name. It’s no secret that Gotti served a 77-month prison sentence handed down in 1999 after pleading guilty to loan-sharking and racketeering. His master plan was no secret either: serve out the sentence, leave mob life behind and live out the rest of his years in obscurity with his family, doing personal penance for so much lost time. The FBI, however, had an entirely different plan. It tried on four more separate occasions to put Gotti back in prison for murder. All four indictments went to trial. All four trials deadlocked in hung juries. Since then, things have been pretty quiet. Perhaps too quiet. No statute of limitations prescribes murders, and the government is free to retry a case that ended with a deadlock. Gotti avoids obsessing about the what-ifs, but still holds a few grudges. “You know I was never treated fairly by the press,” he says of his media coverage. “The [New York] Post and Daily News slaughtered me. We’d have a banner day in court, and you’d never read about it.” Gotti firmly believes that news outlets were spoon-fed courtroom info directly from federal sources with the express agreement that there was to be no pro-Gotti coverage. His most recent legal entanglement came in 2008 when Gotti Jr. was brought up on charges of racketeering and conspiracy to commit murder. They were built around the testimony of an FBI informant named John Alite, who claimed to be a trusted Gotti associate, but nevertheless fingered Gotti for masterminding three murders. The general public may have forgotten the name, but mention Alite to John Gotti Jr., and he becomes animated, in-your-face—quick and focused. This 50-year-old from Howard Beach, Queens, is still fit, carrying plenty of the muscle on his frame that he built from another life, in another time. He tenses and his eyes narrow. If there were intemperate flashes of violence in his past, today Gotti, still intent on having a voice and clearing his name, only indulges the occasional rant. What happened next, according to Gotti’s chronology, may seem ironic, but it’s a piece of mob history that few people are in a position to relate. Despite Gotti’s attempts at complete excommunication, Alite’s name resurfaced one night a few years later at a dinner meeting with Robert “Bobby Cabert” Bisaccia, who handled the Northern New Jersey territory for the Gambinos. A Gotti nemesis for years, FBI agent Theodore Otto was the frustrated operative assigned to the Gambino family. He was instrumental in building the three previous cases against Gotti Jr. Those charges included an alleged plot to kidnap and murder the radio talk-show host and Guardian Angel founder Curtis Sliwa. The case went to trial three times in New York between 2004 and 2006. All three trials ended in deadlock and Gotti walked away. Gotti shakes his head in disgust. RICO is an acronym for Racketeer Influenced and Corrupt Organizations Act. A law aimed specifically at organized crime, it gives prosecutors wide latitude to confiscate the property of the accused. The witness’s lack of credibility undermined the prosecution’s case and again the jury was deadlocked. Federal Judge Kevin Castel declared the case a mistrial and Gotti went free on December 1, 2009. The likelihood that the prosecution will go after Gotti a fifth time is very slim. But the lingering impression that he somehow got away with murder still bothers Gotti, which is why he’s so vociferous about discrediting Alite, even years after his defense attorneys have already done the job. Gotti was watching television with other cadets at the academy when a news program aired a special on the Gambino crime family. He didn’t think much of it until he saw surveillance photos of his father in front of the Ravenite Social Club in New York. Far more tragic news from home reached Gotti Jr. upstate when he found out in March of the next year that his youngest brother, Frankie, was fatally hit by a car while riding a minibike. He was 12 years old. Gotti recalls Christmas Eve 1988, a pivotal day when he was, as he puts it, “officially brought into this world” and became a made member of the Gambino crime family. What his father’s management style also did not include was yelling at captains and crewmembers in front of others. According to his son, if he had a problem, he gave a private reprimand—unless the dressing-down was for a violation of one of Sr.’s cardinal rules. Junior continued to operate out of the public eye until his father, the highest-profile gangster of the era, was convicted of a series of crimes that included murder. Most know the story of one of the most sensational mob betrayals in mafia history. Called “The Teflon Don” after escaping a series of murder charges, Gotti Sr. was finally brought down when his underboss, Sammy “The Bull” Gravano, turned state’s evidence in 1991. The FBI contends that Gotti Jr. went on to run the Gambino crime family while his father was in prison. Gotti Jr. denies the claim. The arrest was not a complete shock to Gotti Jr. The FBI had been storming Gotti properties since 1997. That same year, the Feds raided another property, seized over $300,000 in cash and found the notorious list that detailed made members under the Gambino umbrella. It made the front page of The Daily News. In January of 1998 Gotti was arrested and eventually pled guilty to charges of loan-sharking, bookmaking and extortion. That’s when he decided that he wanted out of mob life. Once Gotti was convicted in 1999, the government moved to financially demolish him as well. Properties were confiscated, assets seized and bank accounts emptied, as per RICO. So how does he claim to support himself outside of the mob life? Real estate. Gotti owns industrial properties in the New York City borough of Queens, and leases them to a series of automotive businesses—body shops, garages, car dealerships and tire distributors. He’s not carrying out canvas bags full of cash, but it’s lucrative enough to keep him living in Oyster Bay, an upscale hamlet of Long Island. His home is a whimsical curiosity, but nothing like the bloated, faux-Roman compound so prevalently shown in the reality television show “Growing Up Gotti,” which starred his sister, Victoria. “That show would have never happened if I wasn’t away,” Gotti says. “Growing Up Gotti” first aired on the A&E network on August 2004 while Gotti was serving out his prison sentence. The show was cancelled in early December 2005. A room on the side of the house monopolizes most of the sunlight. It’s cordoned off by double doors and Gotti calls it “The Indian Room.” This is where he spends most Sundays, smoking cigars and watching sports on television with his sons. He prefers mild to medium-bodied cigars and smokes three to four cigars a week. Native American statues and headdresses compete for attention with portraits and photographs of the late John Gotti Sr.
Gotti Sr. died in prison of throat cancer on June 10, 2002. Gotti has spent much of last year cloistered in a private office writing a memoir, which is full of court documents and transcripts that the public never had the opportunity to see. Entitled Shadow of My Father, it echoes much of the sentiment expressed here: the undying love for his father and the declaration that he’s completely out of the criminal life despite the FBI’s expensive and fruitless efforts to prove otherwise.